I’ve been a rather slow convert to the open-access movement. Though ActiveHistory.ca operates under a Creative Commons Attribution, non-commercial ShareALike copyright license whereby you’re free to repost this (or any other essay you find here) so long as you provide us with attribution and do not profit, this was my sole venture into the world of open access. Then in 2015, Thompson Rivers University historian John Belshaw approached us about promoting his new two-volume open Canadian history textbook (click here for pre-Confederation and here for post-Confederation) published as part of the BC Open Textbook Project (we ran two posts about it here and here). Belshaw’s books were the first open access textbooks I encountered. I was excited and – having gradually moved away from textbooks in my teaching – integrated them as support material for my Canadian history courses. Until recently, these were the only open projects with which I have been involved. Though I was never fully resistant to the idea, I also never pursued it with much interest. I have been fortunate enough to move from academic contract to academic contract in such a way that only for a few months have I ever been without full access to a university’s library subscription services. From my vantage point, as a student then professor, all of the on-campus resources I used were free. This, of course, is not true. Both institutionally and personally, the costs to purchase educational resources are significant. At Ryerson University, a school with about 50,000 students, the library’s annual acquisition budget for serials, databases and e-journals is over $4.7 million, about $94 per student. Add to that the books, computer software and other course-related materials faculty demand of their students, and the total nears $800/year. It was figures like these that brought me around to fully embracing Open Educational Resources (OER) as an important part of my pedagogical and curricular outlook. It was one particular talk, by Kwantlen Polytechnic University Psyche Prof. Rajiv Jhangiani, that opened my eyes. In his talk, Jhangiani did the math for my own institution (Western, not Huron, for those reading the fine print). At Western, students pay about $8,000 in tuition and another $9,000 for housing and subsistence off campus for a total of $18,000 per year when books are also included. For on-campus students the number is closer to $21,000. Depending on where they live, a student without recourse to scholarships, bursaries or loans, would need to work full time at the minimum wage for between 32 and 38 weeks to cover the cost of studying full time. With only 17 weeks available in the university summer break; this leaves about half that amount to be earned during the academic year through a part-time job. Without outside financial support, a student cannot dedicate their full attention to their studies; they are required to dedicate substantial energy to ensuring they can pay for their studies. The point here is partially one about accessibility to post-secondary education and partially one about student behaviour. In Canadian history the entry-level textbook with a primary/secondary source reader is about $150 per semester; a steep price for many of our students who don’t envision a future where these resources will be drawn upon again. Jhangiani asks how students respond to this context of expensive course material. His answer is that “54 per cent of B.C. students [his home province] do without at least one of their required textbooks, while 27 per cent take fewer courses and 17 per cent drop courses, all because of high textbook costs.” Unsurprisingly, it is visible minorities and students with most financial need who tend to occupy these demographics. I won’t go into detail about how large publishers hold university libraries is a similar position. University Affairs has covered the subject well here. Suffice it to say that this system creates similar barriers within the institutional setting. For those of us teaching history, it doesn’t have to be this way. We can make an intervention. First, traditionally closed resources are becoming open. Led by the B.C. Open Textbook Project, provincial governments are beginning to support the creation of alternative resources like Belshaw’s textbooks. Through eCampus Ontario, a similar agency to Open Campus B.C. (both house open text book libraries), Sean Kheraj and I are in the middle of creating a companion to Belshaw’s books, tentatively entitled The Open History Seminar. You can view the prototype here (critical feedback welcome). We will be presenting a more complete version during the poster session at this year’s annual meeting of the Canadian Historical Association. This work builds on similar open access decisions made by the editorial boards of prominent journals such as Acadiensis, B.C. Studies, Canadian Journal of Native Studies, and Histoire Sociale/Social History, who have made their material open after a two-year embargo. Special note should be given to Historical Studies in Education, however, who have made their journal completely open access. University of Calgary Press has similarly embraced open access publishing, making its titles available online under Creative Commons copyright licenses. Second, much of this shift has happened because of the democratization of publishing made possible through the digital turn. A culture of open source production has developed and has transformed the research and teaching landscape. The flagship project is probably the Internet Archive, but we might also point to how most governmental archives have developed digitization programs (Ian Milligan has a good post here about using soldiers’ digitized attestation papers at Library and Archives Canada). Many universities and colleges are using open source software as part of their operations. Every university I have worked at over the past decade uses open source software for their learning management systems (Moodle at York and Acadia, Sakai at Huron and Western). Many of our colleagues have also been busy supporting this work. The Canadian Encyclopedia and Dictionary of Canadian Biography are perhaps the best known accessible, but not open, projects; we might also add projects such as the University of Victoria’s Great Unsolved Mysteries in Canadian History or Ronald Rudin’s work on Acadian history (Remembering Acadie and Returning the Voices). The Raid on Deerfield: This site provides an analysis of the French Canadian/Indian raid on Deerfield in 1704 and its causes and impact on the participants and victims. OutHistory.org: OutHistory.org is an ever-growing website on lesbian, gay, bisexual, transgender and queer (LGBTQ) US history, produced by the Center for Lesbian and Gay Studies at the City University of New York, Graduate Center. Using MediaWiki software, OutHistory.org allows any user to add discussion threads, edit content, create new pages, and upload images, audio or video files. OutHistory.org makes it easy for teachers to bring primary materials documenting the history of sexuality into their classroom. OutHistory.org also provides a unique platform where students can publish papers or create digital history exhibits about the LGBTQ past. Nature, Environment, and Empire: This course [designed by well known environmental historian Harriet Ritvo] is an exploration of the relationship between the study of natural history, both domestic and exotic, by Europeans and Americans, and concrete exploitation of the natural world, focusing on the eighteenth and nineteenth centuries. Women and Social Movements in the United States: This site, funded by the National Endowment for the Humanities, mounts on the WWW editorial projects consisting of primary materials that explore the history of women and social reform in the United States between 1820 and 1940. Currently (November 2000), there are 22 projects with about 450 primary documents for use in high school and college classrooms. New material is added regularly. Topics covered include issues of race and gender, the struggles of working women, women’s suffrage, temperance, moral reform, antislavery, and women’s rights. The central point here is this: there is ample secondary and primary material available online, and through our institutional libraries, to make it unnecessary to charge students money for course materials. Open pedagogy, though, goes beyond choosing accessible resources from which our students can learn. It also involves changing how we think about our classroom practice. It means demonstrating to students that although they do not need to pay for their course materials, there are costs involved in their production. Open cultures work because users are willing to also be contributors. This is something that needs to be taught. 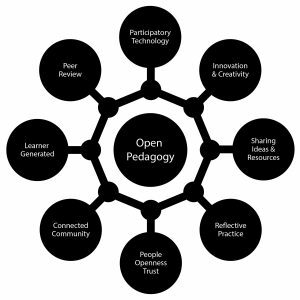 Eight attributes of Open Pedagogy by Bronwyn Hegarty (Click the image for the article for which this infographic was created). Because of this, when I had my epiphany about OER after hearing Jhangiani’s arguments, I decided not just to draw exclusively from open access and library resources in my Canadian history courses, but also to design assignments where students contributed to our understanding of Canada’s past. I was somewhat introduced to this idea last year when Daniel Heidt convinced me there was merit to having my class participate in his crowd-sourced Confederation debates transcription project. This year, my solution was to have them edit Wikipedia. I won’t go into much detail about this experience because, once again, I am a relative latecomer to this activity; on numerous occasions colleagues have posted here about their experiences with Wikipedia (click here for a list of essays). I will, however, note that Wiki Education has a relatively streamlined and easy to use system to support this type of assignment and, with final projects now completed, I have been relatively happy with the results (you can view them here). In sum, what I hope to have demonstrated here is that the time has come for us to rethink most of the pedagogical and curricular practices associated with our discipline. The resources exist to present our students with a much more accurate understanding of the historians’ craft at substantially less cost to them. Additionally, the move towards crowd-sourcing transcription projects and wikis – when centred on student learning rather than service to a larger research project – create opportunities for our students to contribute to our historical understanding of the past. Many readers are already doing this. It was not until last November though, when Rajiv Jhangiani spoke at Western’s Open Education Day, that I saw the potential opportunities open pedagogy presents for students. The transition to open is difficult. I still have not fully embraced this culture. In fact, just last week I had an article about 18th- and 19th-century Indigenous intellectual traditions come out in a closed journal (yes, that was a shameless plug, if you have access to a university library that subscribes!). Changing systems, behaviours, and norms is a difficult task. I have written this post for those who, like me, have been slow to come around and are still learning what embracing the culture of open means. The time is now, however, for us to start making this change. Thomas Peace is an assistant professor of Canadian history at Huron University College and an editor at ActiveHistory.ca. Consider submitting this awesome post to the OPN at http://www.openpedagogy.org. Done! I’m sorry it took me so long to do so.